We’re changing the way America buys sleep. Tens of thousands of Americans are getting the rest of their lives – for the first time in their lives – after purchasing an intelliBED online or through their doctor. But we get it – buying a mattress online can be kind of scary. You want to test drive a car before you buy it, so why not test a mattress? Well it’s not that simple. They see the ads. They go to the store. The salesman tells them to try different beds in their price range. After lying down on 3 or 4 beds for 5 or 10 minutes they make a choice. And that’s where it all goes wrong: It’s impossible to judge how a mattress….any mattress…..will support your body by laying down on it for a few minutes – or even a few hours! It’s why in our effort to perfect the science of sleep we’ve done all the work, all the research, collected and analyzed all the data, FOR you – in the effort to create the world’s most scientifically advanced and comfortable mattress. So you can rest assured that the bed that arrives in your home is, well…perfect. And then we give you 60 days to make sure its exactly right for you! Perfect – and guaranteed. Sleep on an intelliBED for 60 days (with our mattress protector) and if you’re not getting the rest of your life – we’ll take it back. No questions asked. And we’ll even pay for the return shipping. What’s more likely? You’ll join our family of satisfied sleepers and tell everyone you know about the great night’s sleep you’re getting. Night after night after night! For more information, please ask the doctor on your next visit. Also ask about our discount code which will get you an additional 10% off when you purchase your mattress just for being our patient! 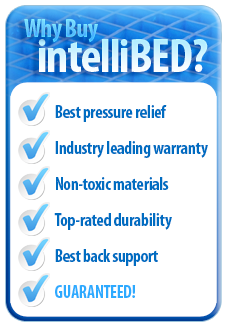 Visit the IntelliBED online store to see the different types of beds they carry that caters to your individual needs. 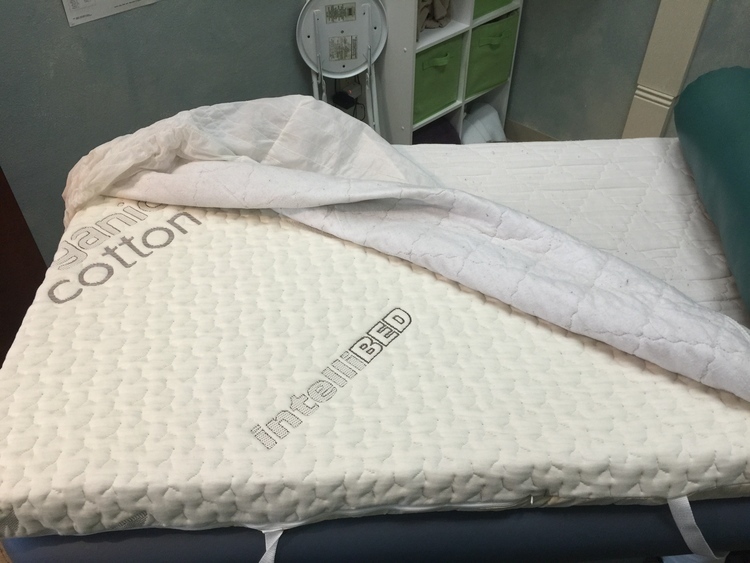 We have a mattress topper in our office now for our patients to try! Please ask about it on your next visit to feel how truly comfortable these beds are! Words do not do them any justice.